Racer X: All three of you guys have talked that some of the tracks haven’t been ripped as deep and they haven’t been as rough. I’d like to get your opinion on the High Point Raceway here. 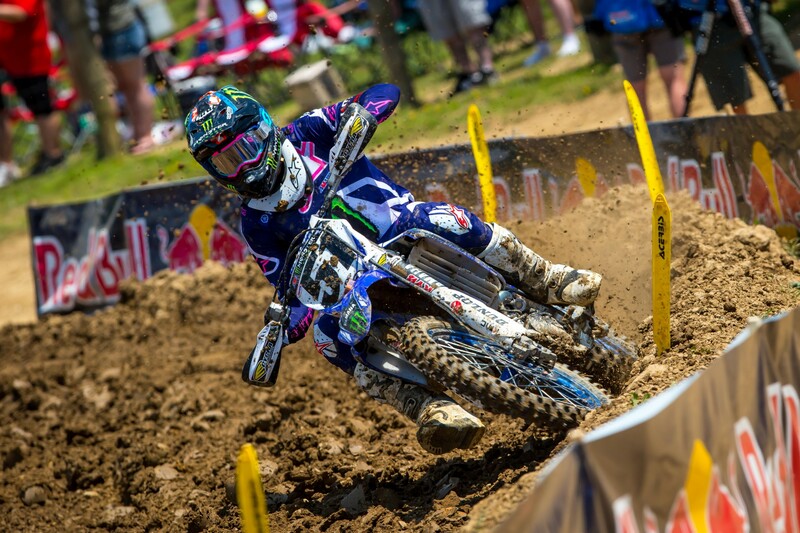 Justin Barcia: It was deep today, and it got rough. It’s a difficult track for sure. It’s always challenging, the hills and the sideways doubles and things like that. I think it was a good racetrack. There was plenty of places to pass and make things happen. All in all, I think the track was good. Eli Tomac: There was no lack of ruts today, that’s for sure. It was good. I was able to get out front early so I didn’t eat a whole lot of roost, so that was nice here. It’s got that heavy clay here, so it’s important to keep the goggles clean. This place always has that big rutted character to it, so it’s tough to race on. Marvin Musquin: Obviously, I love the track. I always do here. I do pretty good. I love coming back to High Point. This year once again they got the track really nice and good traction. They were able to make different lines. That’s what we need. Those off-cambers and those turning doubles, that triple up the hill…. So many things on that track makes the racing really good. I always love coming back here, and I had a great day. Eli, you came into this race with a six-moto win streak. Moto one didn’t quite go your way, but you were able to score the overall to keep that portion of it intact. What was it like suffering that first setback, if you will, of 2018 outdoors? Tomac: The first one was tough. I wasn’t as good as Marv that one. Was fighting my turning a little bit. You got to be just really perfect if you want to be the guy on top right now in this class, and I wasn’t that. I just was fighting and wasn’t flowing. At least went back and regrouped and got closer. Marv was all over us at the end of the second one, but it was just good enough. Justin, you said on the podium that you basically rode most of the second moto without a front brake? Barcia: Yeah, I ran into someone in the second corner. Just happened. This is probably one of the hardest tracks to ride without a front brake, I feel like. So it was really difficult. It took me a while. I went down because I didn’t have my front brake, and then [Weston] Peick got around me. Then it took me forever to get that flow riding without my front brake. I caught up to those guys somehow, but just was a little too late that second moto. Musquin: Yeah, exactly. That’s the goal. It was amazing. Definitely overall the weekend was great, but that first moto was definitely awesome. I could see following Eli I had good lines and I was able to see where he was going, obviously, and had better lines. I was feeling really comfortable. So to pass him and get that first moto win, it was awesome. Just wanted to do the same thing in the second moto, but I could tell he had better lines that second moto, better flow. That intensity was really high, that second moto. I don’t know how far back the third place was, but I’m pretty sure it was a big gap. We pushed really hard. That’s what I want to do. I just want to fight with whoever is up front and battle for the lead. I had a blast. I know I came up short. That’s a bummer. It’s second overall, but to win a moto and get a second is definitely something to build on. That felt good to have a weekend off, and I was able to put in some really good work for two weeks. I felt great this weekend. Marvin, in that second moto, it looked like you had the lead for about half a second in there. That was a great battle between the two of you. Musquin: Yeah. Always in this situation, I’m pretty sure when I’m going to watch the video, I’m like, “I could have done this, or that!” But in the moment, it was really intense. I could see Eli was pushing, I was pushing. On the track like that, if you push a little bit too much, you can make big mistakes and lose a lot of time. So we were on the edge. Like I said, it was tough physically, but at the end it was definitely fun. I think the crowd loved it, too. We’ll build from that, and hopefully many more to come. Eli, in that first moto, was it more bike setup, line selection? What kind of changed for you? Tomac: It was a combo of both. Just not feeling comfortable, and Marvin was on it. He just caught up to me and rode right around me, basically. Went back and changed a few things. It’s just crazy what that does. When you have that comfort level, it changes your riding and then you can ride that whole 30 minutes where you want to. We did that, and luckily we hit it the right direction. In the second one, did you know where he was going to try to make moves on you, or could you feel where he was kind of going to do something different? Tomac: Oh yeah. I knew the last two laps it was going to be game-on. At the same time, we were both darting through traffic and lappers. That was a whole other game to play with that. It was like playing a game of chess. I knew if I could get to the top of this hill up here, it was at least pretty one-lined down through the ruts. It wasn’t easy to play defense, but you could do it here because some of the inside ruts were so dominant. Marvin, he mentioned the lappers. It looked like you weren’t able to get to some of your lines kind of late in the race. How big of a problem were the lappers? Musquin: Yeah, sometimes when you’re the leader, it’s hard when you first caught up to the lappers. Those guys were battling for their spots. I’m pretty sure sometimes when they don’t look, they think that’s the guy that is coming that they’re battling with. I could see that sometimes. The guy would just get back on the main line and I’m like, “Oh no, get out of the way!” It’s so hard. It was so intense. Physically you were at the limit, and it’s getting close to the end. Man, like Eli said, it’s a different game to deal with lappers. It makes it even harder on us sometimes. Sometimes you take different lines and the feeling’s not the same. You’re trying hard, but it works, it doesn’t work. You never know. At the end, it was definitely tough with the lappers today. But we made the best out of it. Eli, we could see the loose pants adjuster in the first moto. Did that contribute to that comfort level you were talking about? Tomac: No. It wasn’t bothering me. That was just Velcro that came undone. That definitely wasn’t the difference-maker in that one. Marvin, can you go through the first moto? It looked like you got off to a bit of a slow start, and then you kind of caught fire late. What changed? Was it finding the right lines or tempo? Musquin: Yeah, and also because Justin got around me in the first lap and I see Eli leading. So I’m like, I got to make it happen. Justin was riding great. I couldn’t get around him for a couple laps. To be honest, I didn’t see Eli getting away, so I stayed calm and tried to make the pass on Justin and find good lines, and I was able to catch Eli. That was definitely a great feeling, to come back and get the win. That’s the best way. To make the pass for the win, that’s awesome. Marvin, did you know coming into today, something during the week or something with the break, that you felt you’d be better and maybe even win a moto or the overall? Or did it just happen to materialize today? Musquin: Like I said, I put in some good work for the two weeks and really focused on myself, doing the work on technique and speed motos. Also knowing it was High Point for the next round, I was definitely excited about it. I love this place. Right away for practice, I wanted to get on it and get good lap times, not like last weekend. So right away the speed was good, the feeling was good. We had different suspension settings for the last two weeks. We’ve been trying stuff and I felt great this weekend. So that’s nice to see. For both Eli and Marvin, the last two laps of that second moto, Marvin, did you have a spot where you thought you could make a pass, or were you just trying anything you could come up with? Or were you picking places? Musquin: Yes and no. Those rollers over there, Eli was going outside and I was going inside. I’m like, if I go for it and he doesn’t see me, we can jump on each other. That section there was really tough. The two lines were coming together. I’m pretty sure on video, you can see we were really close. Like I said, Eli had better lines that second moto compared to the first moto. So that was definitely really tough to get around him, but I tried my best. It was really intense. Like I said, I think it was good for the fans, but I wish I got it done. Eli, did you have a feeling of where the pass might be coming from and what sections you had to grease to make sure it didn’t happen? Tomac: Not really. Maybe the rollers. He was better there on the inside all day. I didn’t like that inside. It was just tough to get the second double and I was just kind of going on the outside. It was like something you could do every time, even though it was a little bit slower. It got really close there that last lap, and I kind of went out to the outside to try to do a little block. It was close over the next tabletop. I don’t know where it was coming from. Then down in the big G out hole right here, that was close again. I was able to play defense pretty good the last two laps. Eli and Marv, we talked about it real quick on the podium, but it seems like anytime you talk about a track, they talk about the Bradshaw/Stanton battles. You guys have officially put your names in the High Point book as some of the greatest racing here. Does that make you feel kind of special now? Is this like one of your homes now, if you will? 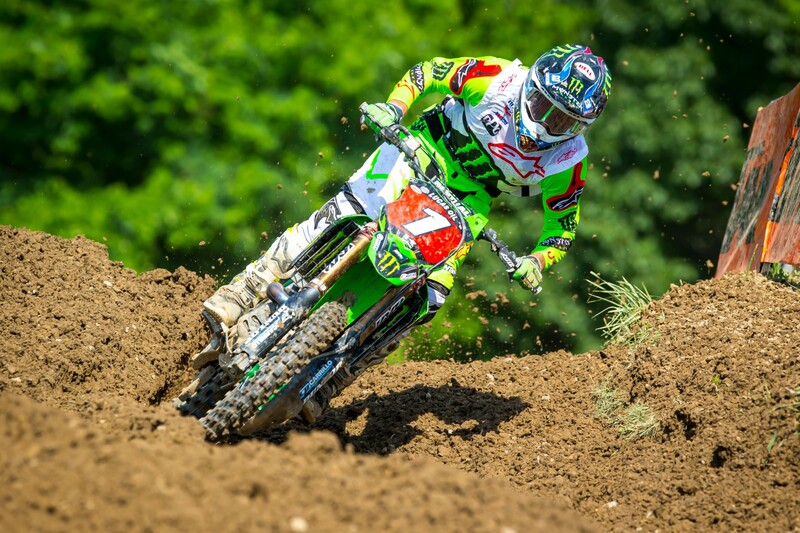 Tomac: Yeah, it was cool. The crowd here today was awesome on the fence there. That’s what everyone wants to see. It puts a lot of pressure on us, but it’s what we’re out there to do. 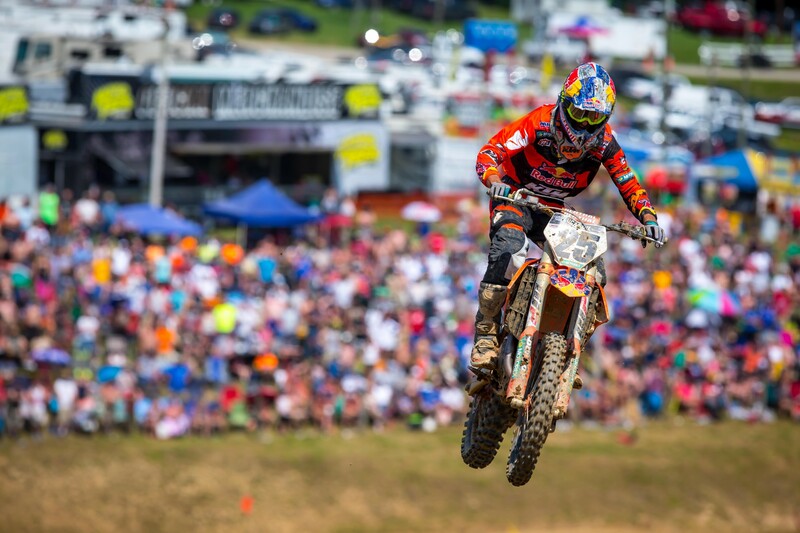 Musquin: That’s what I said on the podium. The fans, that’s what they want to see, a battle like that. I was really happy after that first moto, and I knew the second moto would be also really intense. It makes me proud to be at this spot and to be able to battle for wins. Growing up watching [Ricky] Carmichael, and I know David Vuillemin won a couple times here. We’ll get it next year and put my name on top.